Explanation: The 16th century Portuguese navigator Ferdinand Magellan and his crew had plenty of time to study the southern sky during the first circumnavigation of planet Earth. 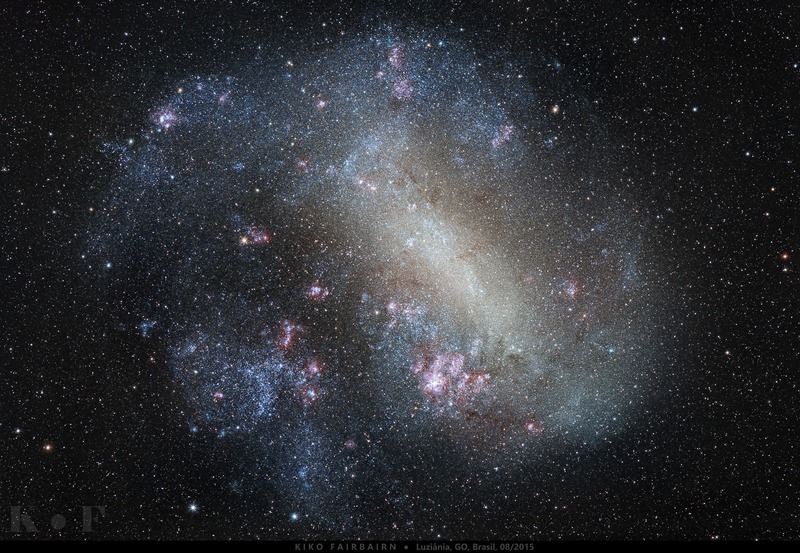 As a result, two fuzzy cloud-like objects easily visible to southern hemisphere skygazers are known as the Clouds of Magellan, now understood to be satellite galaxies of our much larger, spiral Milky Way galaxy. About 160,000 light-years distant in the constellation Dorado, the Large Magellanic Cloud (LMC) is seen here in a remarkably deep, colourful, image. Spanning about 15,000 light-years or so, it is the most massive of the Milky Way's satellite galaxies and is the home of the closest supernova in modern times, SN 1987A. The prominent patch below centre is 30 Doradus, also known as the magnificent Tarantula Nebula, is a giant star-forming region about 1,000 light-years across.